Smart NaMo, an upcoming firm from India, recently launched a series of devices, including a powerful quad core device with impressive specifications and a 6.5 inch phablet. Here we are to talk about a third device from the same firm, dubbed as the Smart NaMo Saffrom A209, which is an entry level device with a 4 inch screen and a 1GHz processor from Qualcomm. The device will be selling for 6500 INR in the coming weeks. Smart NaMo haven’t yet disclosed the official camera specifications on this entry level device. Based on the other specifications of the device, we would imagine that the device packs a main rear camera of 3.2-5MP, and a front unit of VGA-1.3MP resolution. Please keep in mind these are just numbers we’ve guessed, and nothing is official as yet. Initial renders of the device show a front camera which is impressive. On the storage front, the device, like most Indian and Chinese devices comes with 4GB of installed ROM, out of which about 2.5GB should be available to the user. However, Smart NaMo, in a bid to impress the buyer, would be shipping a free 8GB microSD card along with this new device. This should be enough for most users, given the nature and specifications of the device. The phone comes with a 1GHz Qualcomm 8225 processor, which you can expect to be slightly below today’s average of dual core processors. The phone, to couple the 1GHz processor, comes with a 512MB RAM, which will allow for a rather outdated experience. Most other phone manufacturers are shipping devices with 1GB of RAM, but given the price of this device, expecting 1GB RAM would not be right from our part. The battery on the device is an impressive 2000mAh unit, which you can expect to last you a bit over a day on average. Given the 1GHz processor and 4 inch screen (both of which don’t sound excessively power hungry), you might even get two full days of runtime on a single charge, something very desirable on smartphones of today. The Smart NaMo Saffrom A209 packs a 4 inch WVGA display, in true entry level sprit. The display is bound to be limited to utility and productivity, and potential buyers should be aware of the fact that multimedia will not be very enjoyable on a 4 inch WVGA screen. However, this might play in favour of you if you’re looking for battery life more than anything else. The display is bound to pull much lesser power from the battery which will mean that you get a above average battery life from this device. 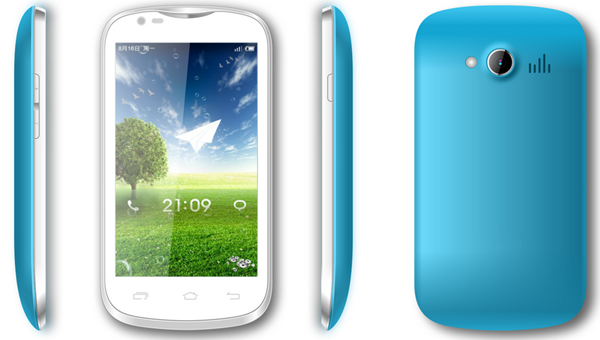 The device comes with dual SIM functionalities, and both the SIMs can be active simultaneously. Most manufacturers, International as well as Indian have moved their focus to mid-range and high end devices, so this might help Smart NaMo capitalize on the market. However, there are a few devices in the market available in the 6.5k INR range which might pose as threats to this device. 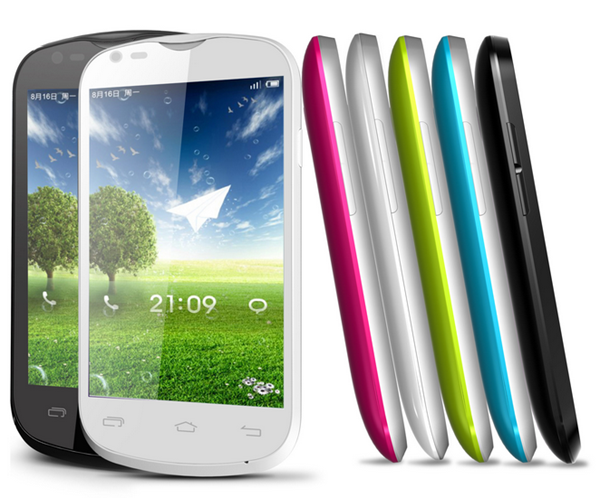 These devices include Videocon A24, Intex Cloud X3 and Celkon Campus A63. It would be interesting to see which brand the consumer favours in the end. The device comes across as an average entry level device. However, the phone has a few goodies like a front camera and an impressive 2000mAh battery, which are not seem in other devices in the same range. Having said that, it is worthwhile to note that the device is pretty expensive at 6500 INR, since phones like the Celkon Campus A63 come with dual core processors for about 2000 INR less! The phone should be available in the coming weeks, and with a few colour options like black, white, blue, pink and green, customers have quite an offering here!